I am so grateful to spend so much time in this blogosphere. BloggingLove has completed its 4 years on the web. On this special occasion of the anniversary, I want to thank everyone. You know that it’s not possible to grow without any support of your fellow bloggers and the readers. Luckily, BloggingLove has gained 75,000+ followers and the people who know that the blog is the place to find the solutions to their problems. I have been publishing the tutorials related to WordPress, social media, and more for a long time. I remember when I started blogging and knew nothing. People were talking affiliate marketing, SEO, and making money. But I have always had a vision for this blog. Most of the fellow bloggers ask me how I manage to write so many articles. As I always say, you need to be consistent to achieve your goals. I follow it every single day. If you check the blog publishing dates, I have been publishing regularly. I even wrote a post about the journey of blogging from 0 to 500 blog posts in a few months. How much time is required to write a post? What’s your favorite post publishing schedule? Do you write yourself or hire a freelance writer? All the three questions will have the different answers based on the perspectives people have. When I say, you should publish every single day if you have the time to promote, people seem so shocked. Well, the more you write, the more content your readers will have to read. What do you think? I know, most of the bloggers prefer to publish once a week. It’s good if you manage to keep the user engagement with your content. This is a kind of sensitive question. When I started blogging, I used to spend more than 6 hours per day but due to my graduation, I didn’t get so much time. But once I graduated, I became the full-time blogger. Most of you know this. Even after having the WordPress projects, I try to maintain the consistency. I have created this blog to help others for free. I know you may be wondering why aren’t focusing on its ranking and all. Well, it’s an open source having no ads running. You may have seen the desperate bloggers showing ads all over their blogs. But on BloggingLove, I believe to make content easy to read without any ads. I only share the tools I have used so that people can get the best. Every WordPress user should know the basics of this platform and how troubleshooting is done. Apart from that, it’s important to know the SEO factors Google considers. I am going to mention the posts you should read. If you still want to read, the blog is yours. 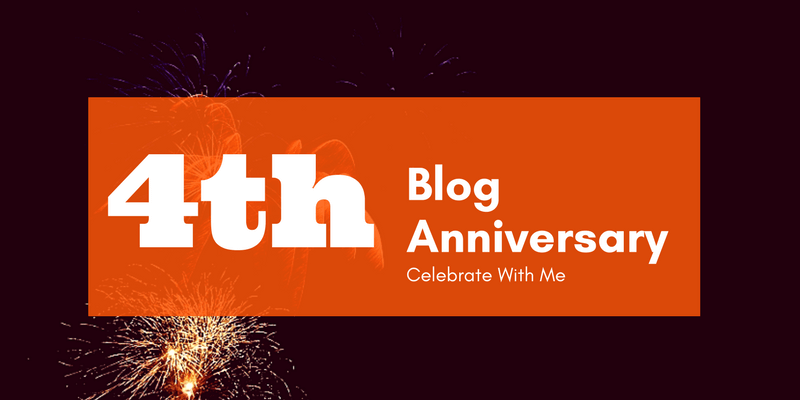 Celebrate the 4th anniversary of BloggingLove with me. Even if you face any kind of problem while running your WordPress website, feel free to use the Contact Us page to email me. Hope to get the love from you just like these four years. How To Add Tweets To Website Without Any plugin? Hi Ravi, wow, you have really grown up right before our eyes here. I would have thought you have been blogging longer though. Did you start out on WordPress or did you use Blogger? Each post I do varies in time from 2 hours to 20 hours depending on the research needed and the artwork to be found or a slide share to be made, etc. I try to publish weekly but sometimes life gets in the way of that. I do write myself but allow contributors on the blog. Thanks for teaching us along your journey Ravi. I know I’ve learned a lot over the years from visiting your blog here. Congratulations on your anniversary! I have been blogging for more than 5+ years. It just I started BloggingLove when I learned about WordPress. I directly started on WordPress platform. Though I have used Blogger, Squarespace, Wix to demonstrate how the migration process works. Every person has a different strategy. Congratulations Ravi. You and your blog have been very helpful for WordPress users and each article of yours teaches me something new. It’s so good to hear something like this. I have created this blog to help everyone. Happy Anniversary to your awesome blog here! I love the value you bring to the niche. You know your stuff man. You know your stuff. Thank you so much for all of your hard work to keep this helpful blog running! Congrats for completing 4 years of blogging. I have learned many things about blogging and WordPress from you. You are really a dedicated and versatile blogger. I hope We will get from quality and helpful post from you. Thanks for sharing your blogging experience. Happy Anniversary to you, that’s amazing. I had no clue that your blog is 4 years old. That’s definitely a great accomplishment and has taken a lot of hard work to do. I am always amazed at how much content you’ve written on your blog. 0-500 posts in a few months is definitely a huge accomplishment and I couldn’t imagine doing that. I’ve personally learned a lot from just reading your blog posts. I appreciate the hard work that you’ve put into sharing your WordPress and blogging knowledge with us. That’s one of the cool things about blogging, is that we get to share our knowledge and expertise with others. This opens up doors to many opportunities. I have no doubt that you will continue to see growth and success with your blog. Can’t wait to see where you are another 4 years in the future.